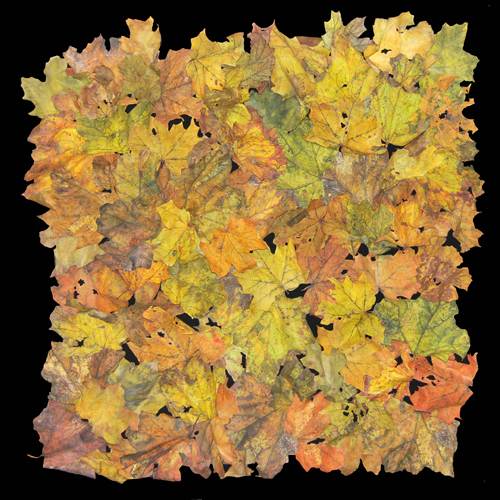 But these leaves aren’t real – they’re stitched! 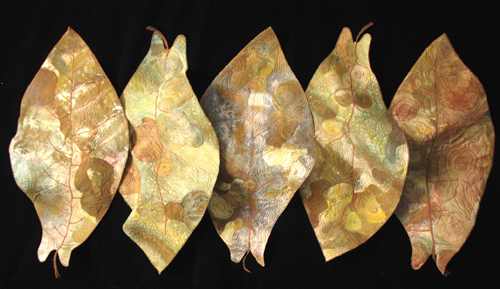 Barbara Schneider’s “Forest Floor,” along with other pieces in her Leaves series, features realistic leaves fashioned from fabric and thread. 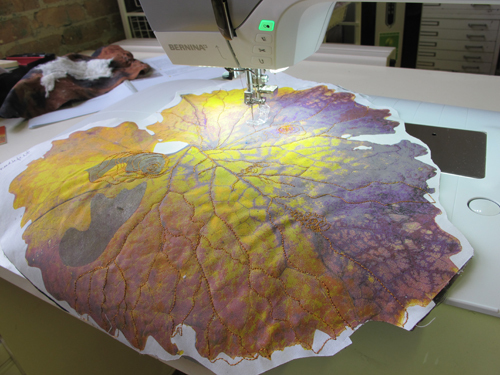 Here she describes her process for creating stitching and shaping her lovely leaves. 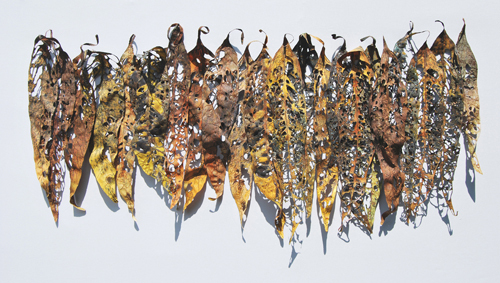 My Leaves series is an exploration and interpretation of these beautiful objects by enlarging and reshaping them. I collect leaves and look closely at their structure and shape. In particular, I like to collect them at the end of summer when they have begun to wither and fragment. Looking at them closely and then enlarging them allows me to see them as sculptural objects. I look at the play of light upon surfaces, and shaping the pieces introduces a new element – light and shadow interacting with the undulating surfaces. 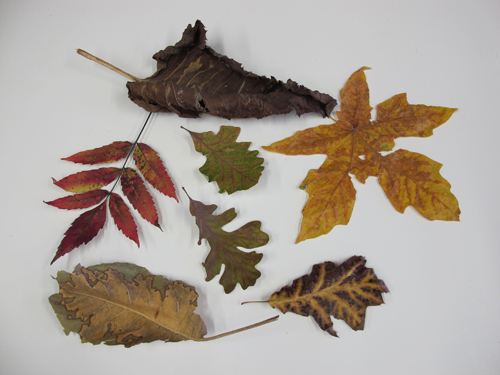 I begin with real leaves that I collect at the end of summer when they beign to wither and twist and change color. 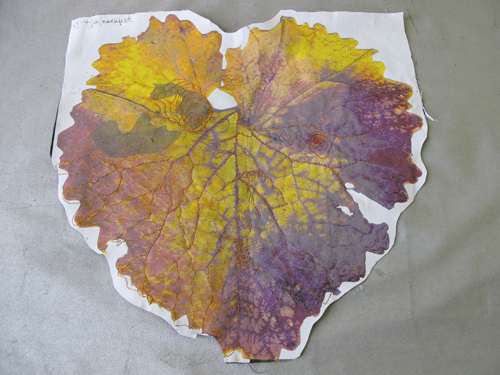 The sample leaf shown later is a very large grapevine leaf that has begun to change color. 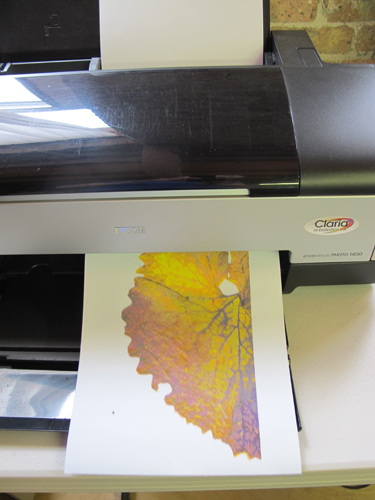 I start by scanning the original leaf on a flatbed scanner. 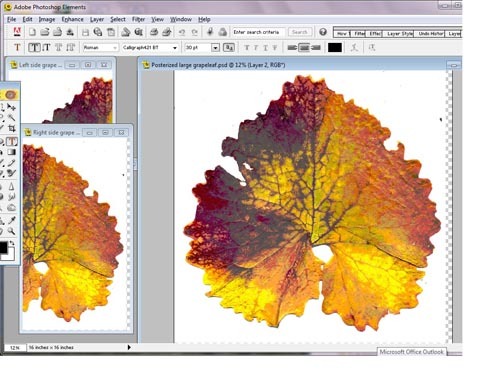 Then I use a photo manipulation program (Photoshop Elements) to enhance and enlarge the leaf to prepare it for digital printing directly onto the fabric. I usually use a PFD (prepared for dyeing) cotton lawn fabric. When I make a piece that is digitally printed I usually need to print it in sections and then reassemble it before moving on to the next step. I work with a 13″ x 19″ printer, but have found that as long as I stay within the width (13”) I can print pieces that are longer than the 19″ length. 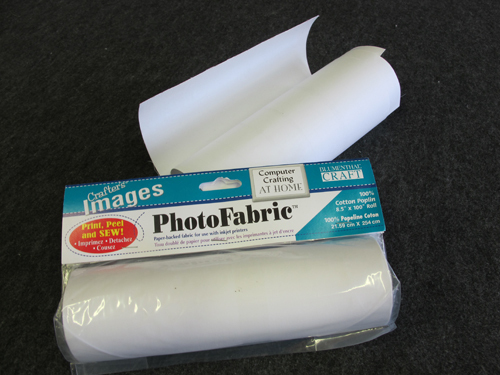 I prepare the fabric by ironing it to freezer paper, set up the print parameters on the computer, and then print the sections with a 1″ to 2″ overlap. I remove the backing paper and then fuse Wonder-Under to the back. I use Wonder -Under or Mistyfuse to join the front, batting (I use just a small amount), and back together. 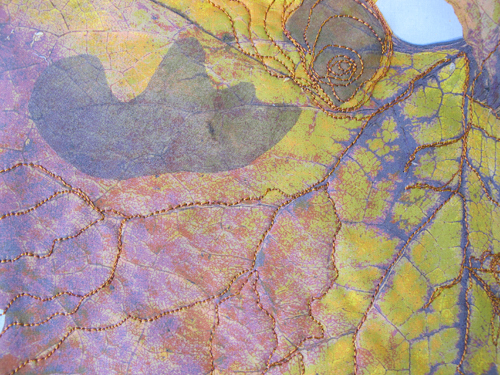 The next step is to add detail and texture with free-motion stitching using a variety of threads to create the veins and whorls and other assorted marks that are on the original leaves. Sometimes I double up threads, sometimes I overstitch or use heavier threads – whatever best expresses the essence of the particular leaf. One of the things that it is fun to interpret is all the markings on the leaves. 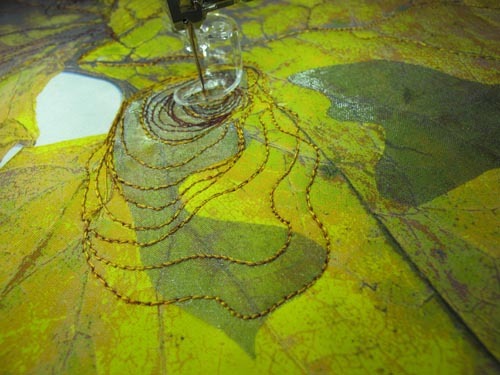 Free-motion stitching with the BERNINA 750 allows me to re-create these markings on my leaf pieces. 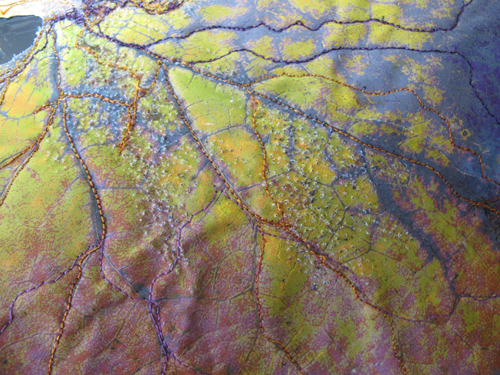 I stitch the leaves with a variety of threads—mostly I use rayon thread for the strength and the lovely colors. I often use two different color threads at the same time for the topstitching as it gives a more mottled feeling which seems right for the leaves. I often combine multicolor threads in varying colorways. For the bobbin thread I use a color that blends with the back leaf fabric color. I use a Titanium-coated Superior Topstitch Needle, size 100/16. I find a have very little thread breakage with this needle. 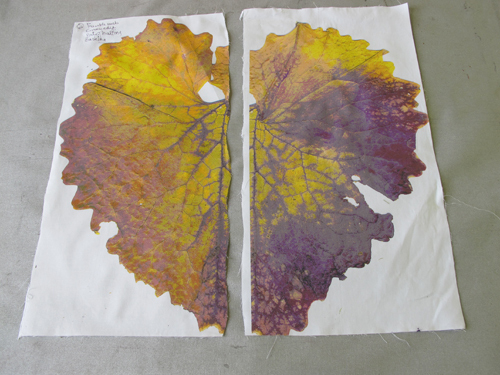 I look closely at my original leaf and try to create the same veins, whorls, and marks that I see in it. This might involve straight stitching, satin stitching, and free-motion stitching, as well as overlapped stitching to build up areas of texture. I change the threads for different areas and work my way around the leaf. I often go back three or four times to add more detail and to change coloration. I try to imagine what the stitching will add to the surface—is it pattern, texture, or color? Whatever it is, I just try to let it flow through my brain and into my hands and then I just go with it! What brings the leaves alive and what excites me about them is creating dimension and shaping them so that they catch the light. After all the steps above, I coat the entire front and back with a thinned-down white glue product (Aleene’s Fabric Stiffening and Draping Liquid). 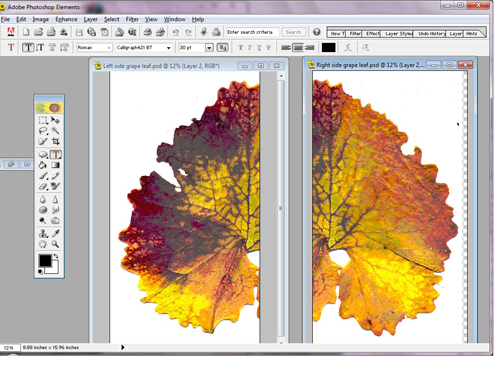 I lay the leaf out on a plastic sheet over my work table. 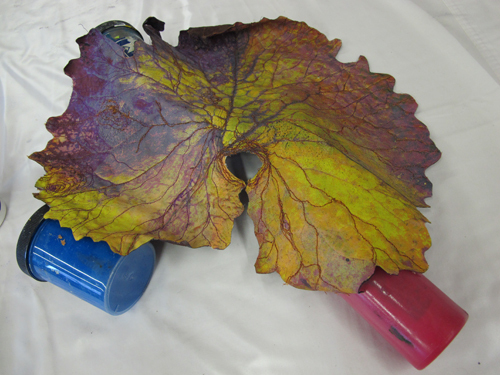 While the leaf is damp and pliable I shape it, using a variety of supports such as small cans or plastic bottles, foam wedges, pins—whatever I need—to hold the leaf in the desired shape for as long as it takes to dry. 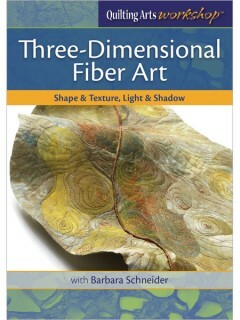 I have published a DVD—Three Dimensional Fiber Art: Shape and Texture, Light and Shadow —with Quilting Arts Workshop / Interweave Press on this process and how to make other things as well. I’ll be hunting for leaves now …..